In honor of young hunters and meat makers I offer up a super simple and tasty venison macaroni-and-cheese recipe. Cheers to those taking out the next generation, and double cheers for the little ones who bring back dinner! This recipe is a riff on Alton Brown’s Italian sausage recipe, with the notable exception that it includes venison. This recipe yields 5 pounds and I will often double it for a big batch – it is great for all sorts of quick-and-easy Italian sausage needs. This will work on just about all red-meated animals too. In a small, heavy-bottomed sauté pan toast the fennel seeds on medium heat until they are fragrant, or about five minutes. When cool add the fennel to a spice grinder or a mortar and pestle. (If you don’t have these, preground fennel will work – just add a teaspoon more and don’t toast it.) Next, mix the remaining ingredients in a large bowl, incorporating them well. Chill the mix in the refrigerator for at least an hour, then divide it into 1-pound balls. Freeze the portioned sausage for use at a later time. Preheat oven to 350 degrees. Heat a medium-sized sauce pan on medium for three minutes, then add the Italian sausage. Brown and crumble the sausage until fully cooked but retaining some moisture in the pan. Next, add the flour and incorporate fully. Then add the milk and reduce heat to low. Bring to a boil and let thicken. When thick, add a small amount of cheese at a time, making sure to stir to incorporate the dices fully. Add the noodles to the sauce, fold them gently to incorporate. Transfer noodle and sauce mix to a 3-quart casserole dish. Spread the mix evenly in the pan. 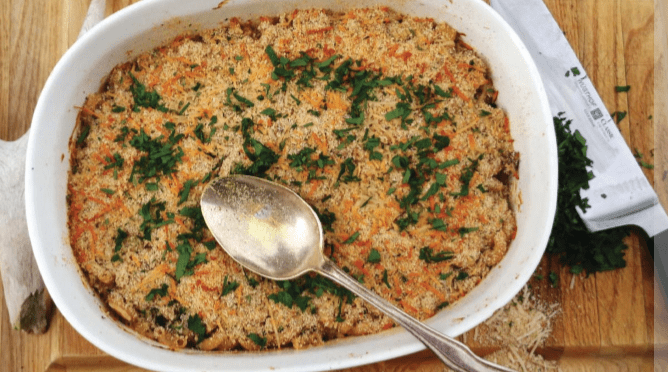 Top with Parmesan, bread crumbs and parsley. Bake for 25 minutes. Serve hot. For more wild game recipes, please check out chefrandyking.com.